Perfect unisex bedding for any room! 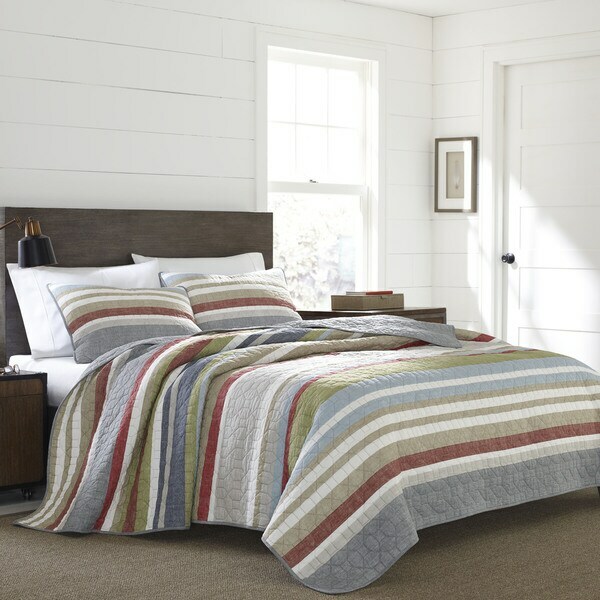 This 3-piece quilt set features a multi-colored striped cotton fabric in hues of khaki and grey to complement your bedroom's neutral color palette. The quilt reverses to a slate grey printed chambray texture for a clean and tailored finish that is wonderfully soft and resistant to pilling. The set is made of machine washable cotton fabric. Please note: Some options listed or pictured may be currently out of stock. All in-stock options are listed near the Add to Cart button. I wanted to update my grandson's bedroom since he has started to college... I chose this color and bedspred with grey curtains. I had just put new flooring and decided to use a rug that I could remove during the summer and put down in cooler weather so I chose the Persian Modern Abstract Pop of Red and it is beautiful... I have not been disappointed with anything I have ordered from overstock. The quilt is a printed piece of fabric with quilted stitching. The colors are soft and pretty and the stitching is well done. It is not a heavy quilt, but I use it as a bedspread with a blanket or duvet under for warmth. It has less blue than I thought and I was disappointed in the pillow shams. The shams only had the gray and tan, so it depends on what slice of material you get with the set. That said, they do match up. The colors are fantastic. The stitching is good. Great looking quilt. Now the disappointing part. The quilt is 100% cotton. The fill is 20% polyester and the lining is 80% polyester. No where in the description is the mention of polyester. I was seeking a quilt of cotton but I guess that doesn't seem to exist anymore. Love his set, bright stripes of many contemporary colors. It is not real heavy but enough wait to lay nicely. At times I turn the quilt to the plain grey side and leave just the striped pillow shams. Very cheery! I like the various colors in this quilt as it provides a lot of flexibility for accessories. It’s a thin quilt so you’ll need a warm blanket or another quilt under it in the winter if you live in a cold climate like I do. I bought a king size for my queen bed and the sides land about 8” from the floor on each side. I haven’t washed it yet, so don’t know if it will shrink, yet expect it to wash well and perhaps shrink a bit given it’s cotton construction. I definitely recommend this quilt. 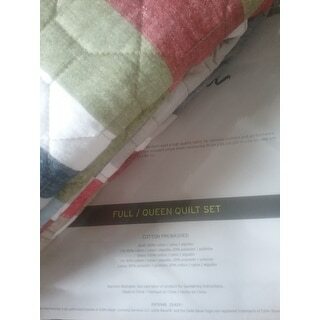 Once I saw this quilt set I knew I had to have it. Unfortunately, the king was sold out for quite some time but I was persistent. Luck would have it that it was restocked and I was able to purchase this ensemble. I absolutely love it. The colors complement one another and it is perfect for the rustic/farmhouse decor. The colors are not too bright and vibrant, which it what I needed. This quilt is a solid piece but lightweight enough to keep you cool if you have a problem heating up at night (thanks to nightsweats). ; ) I could not be more pleased with this purchase. Good quality, nice light weight, and beautiful colors! I love the stripes, and because the double/queen is a square, the stripes can go either way. I also really like the shams. The coverlet came within a day of ordering and shipping was free! Got this for our son's bedroom. We needed a lighter quilt set set to replace his current one and something a little bit more colorful as his room is mostly grays, browns and blacks. 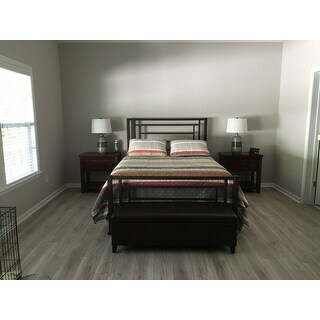 This quilt set brought in a nice "pop" of color that was still muted and and the lightness of the set is perfect for the upcoming Texas weather. Purchased this quilt for my 20 year old son's bedroom. Looking for an updated nautical look that featured greys, beiges, and cinnabar red. This quilt fit the bill perfectly! Well made and washed up nicely. Love it (would love even more if I had waited a couple weeks and gotten it on sale) but I'm really happy with it so far. Colors are true to those seen in image on website. Great material! Feels great. Won't pill . This set is perfect for my son’s bedroom. Nice, muted colors which can match nearly anything in the room. Nice and light and perfect for spring. Wish it had a bedskirt, but I plan to pick one up and it will be easy to match. 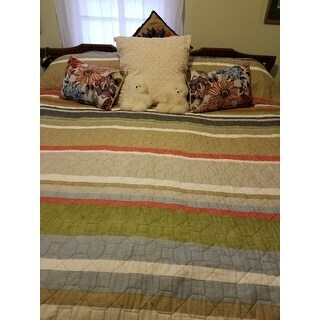 Just up sized from twin to full for our guest bedroom and this quilt set checked all the right boxes...perfect colors, weight and price! Thank you Overstock and UPS...delivered a day earlier than expected. Love, love my purchase. All the different colors I can coordinate with. Appears nice, works well. The down side for me, have a cat and it's not very durable material, so after only a few weeks there are multiple rips in it. Enjoy the look on my bed and the colors, it give me a choose of what colors I want in my room. "What description would you give the colors. Everyone says they are gorgeous but is the red rusty or red? Green sage or beige? Blue or grey? I am trying to pull together soft light green walls and a red multicolor oriental rug w/ honey color wood furniture." This may be too late for you, however, in my bedroom with light green walls it looks awesome! I have rust, green and blue (baby blue and medium blue jean color); it does also have grey and beige. The one I received looks exactly like the picture on the website. "I am wanting to purchase the king size but would like to know if the shams are king size or standard?"